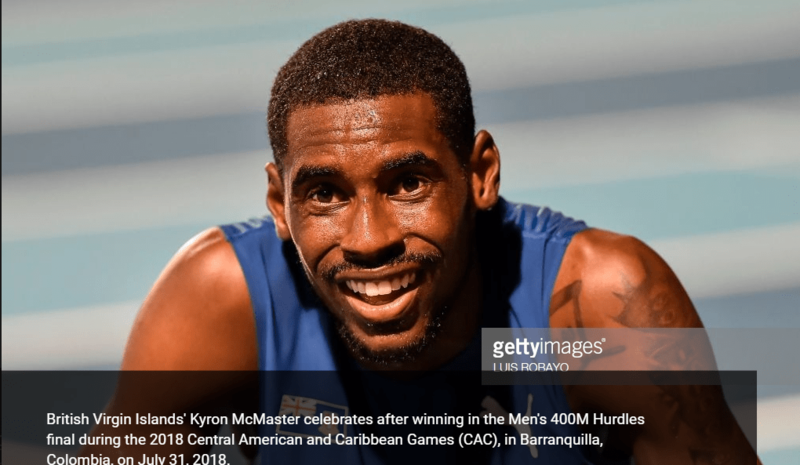 BARRANQUILLA — Kyron McMaster led a record-filled evening on the third day of athletics on Tuesday at the 23rd Central American and Caribbean Games in Colombia, where the host country and Jamaica each won two gold medals. British Virgin Islands’ McMaster, the third fastest man in the world this year, produced a dominant performance in the men’s 400m hurdles, the ninth and last final of the day, as he crossed the finish line in 47.60, his second fastest time ever and almost a second faster that the eight-year old Games record of 48.47. McMaster, 21, became the fourth athlete from the BVI (two men and two women) to claim gold in the history of the Games. His next goals are the NACAC Championships in Toronto next week and the IAAF Diamond League final. McMaster’s performance capped a prolific evening of records, six in total. Half of them came in the first round and semifinals of the men’s 200m. In the first round, Colombia Bernardo Baloyes lowered his Colombian record to 20.04, much better than Churandy Martina’s CAC mark of 20.25, set in 2010. Baloyes improved that time again to 20.00 seconds in the first semifinal. But that record was to be short-lived as Edward rewrote the books one third time in the evening with 19.96. Trinidad and Tobago’s Kyle Greaux pushed him all the way and was rewarded with a personal best of 19.97, the third athlete ever from his country to break the 20-second barrier. All men who finished the second semifinal advanced to Wednesday’s medal race. The field events also produced top class performances. Mexico’s 2016 Olympic Games fourth placer Diego del Real broke the 20-year old Hammer record with a 74.95m effort in the fifth round to dethrone Cuba’s defending champion Roberto Janet, who had to settle for bronze. Cuba enjoyed a much expected double in the women’s discus, that saw gold medal winner Yaime Perez and 2015 world champion Denia Caballero improve the latter’s Games previous record three times. Perez, the second best ranked woman in the world this year, opened with 63.76m, but defending champion Caballero responded with 64.99m, half a metre better that her previous Games reacted. Perez reacted and released the 1kg implement to 66.00m in the second round. Caballero improved to 65.10m also in the second round but was not enough to regain the lead. Second four years ago, Perez secured her first international senior title and defeated Caballero for the first time in a major competition. Jamaica added two more gold medals to lead the medal tally after three days with five titles. Rhonda Whyte took the 400m hurdles gold in 55.08, leading six of the eight finalists under 56 seconds, including Mexico’s Zudikey Rodriguez and training partner Zurian Hechevarria, who were rewarded with personal bests of 55.11 and 55.13 respectively. In a 19-man long jump final, Ramone Bailey produced his best leap of 8.07m to take gold in the sixth and final round. Billed as one of the top names of the Games, Cuba’s world leader and 2018 world indoor champion Juan Miguel Echevarria suffered from a nagging pain in his right leg during warm-up and withdrew before the final got underway. The local crowd was pleased with their double in the 5000m. Jose Mauricio Gonzalez became the third Colombian to win the title, clocking 13:53.40 to end Mexico’s 30 year hegemony in the event. In the women’s race, national record holder Muriel Coneo moved away with 300 metres to go to overtake 2010 champion Beverly Ramos and 2014 gold medallist Brenda Flores of Mexico. Coneo will attempt a double in the 1500m on Wednesday, an event she won in 2014 and dominated by Colombian women at the Games since 2006. A historic gold came for Costa Rica in the women’s Hurdles, when Andrea Vargas became her country’s first woman to win gold at the CAC Games. The 22-year old set a new national record of 12.90. “I have worked hard to get to this gold and I want to share this win with my mom (and coach Dixiana) and my daughter (two-year old Abril),” said Vargas, who emulated 2012 world indoor 400m champion Nery Brenes as the two CAC Games champions from Costa Rica. Brenes won in 2010. Vargas’ younger sister Noelia competed in the 10,000m race walk at the 2018 World U20 Championships in Tampere. Barbados’ 2017 World Championships finalist Shane Brathwaite took the men’s 110m Hurdles gold, the same feat achieved by countryman and 2009 world champion Ryan Brathwaite in 2010. Twenty minutes after his win, he returned to the track for the 200m and advanced to the semifinals. Thirteen finals will be contested on Wednesday, starting with the men’s 20km and 50km race walk, featuring Colombia’s 2017 world champion Eider Arevalo and Guatemala’s 2012 Olympic silver medallist Erick Barrondo in the shorter distance. The track and field finals will include both 200m and 400m, the second day of the heptathlon with Cuba’s Yoreglis Rodriguez in the lead and the women’s triple jump, where two-time world and 2016 Olympic winner Catherine Ibarguen will look to add another gold to her CAC collection after the long jump victory on Monday.